This was the start of my workshop in France. After have exhausted my shutter finger in Rome I took very, very few pictures in Ile de Berder. I was also in seminars for 9 hours a day plus social / networking dinners for 2 hours each night. There was little time for photography. Fishing time also came at a premium. On Sep 22, we arrived at Ile de Berder at 5pm. This region has fairly large tides. 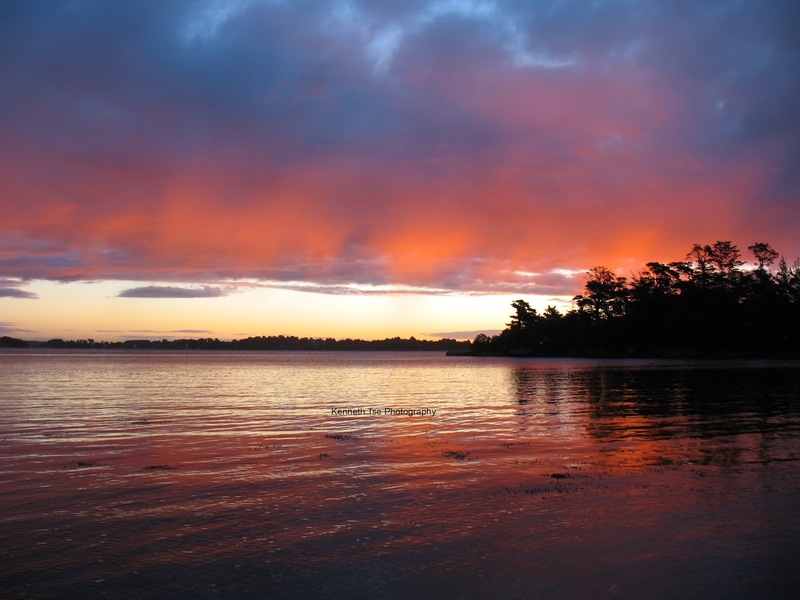 During my stay, the tide differences was more than 3 meters according to the tide charts. Ile de Berder is an island during the high tide, but the seabed would be completely exposed during low tide. In the picture below, the two rocky dyke bordered a paved road which was submerged during the high tide. When I was looking at the map and at various pictures on Google, this location looked promising to hunt for European seabass. I returned later at night to fish this area on the falling tide. It wasn’t until 9pm that we had finished dinner and there was only 2 hours until dead low tide. The area was extremely rocky and full of kelp. I was fishing the T&C swim grubs on 3/8oz jighead at the beginning. I needed the weight to fish in the heavy current generated by the falling tide. However, the lure was snagged and lost within 2 casts since the shallows had very slow current and low water. I tried to fish with a lighter jighead but the lure would wash through the current too quickly. I heard and saw two surface feeding signs so I fished the area with various lures for about 30 minutes. At the end, I put on a 1/8oz jighead with a Powerbait T-Tail that was trimmed to 1.5” long. I chose to cut the soft plastic shorter since I saw many small baitfish in the shallows around that size. When I couldn't find anything biting at the dyke, it was time to try other fishing areas. Fortunately, there was a map that I could consult and I quickly found a beach on the other side of the small island. I tried a few casts with the T-Tail off the sand but the water was shallow and filled with kelp. About 50 feet to my right, there was an old dock. The top of the dock was wet but exposed. During high tide, this dock would be submerged. After making my way to the dock carefully, I heard a couple of surface disturbance. Looking around with my headlamp, I saw many small baitfish in the shallows. I had fish for striped bass at Montauk before. The striped bass is a cousin of the European seabass and similarly these fish are opportunistic nocturnal feeders. Knowing that striped bass were cautious of light, I switched off my headlamp and waited for a minute. This also allowed my eyes time to adjust seeing in the dark. During my wait, I heard a topwater explosion quite far from shore. After my eyes had adjusted, I fired a cast as far as possible into the deeper water. As I was lifting my lure out of the water, I heard another topwater swirl to my right but closer to shore this time. Purely by reaction, I fired a cast in the direct and got picked up by a fish on the first crank! FISH ON! It was fighting pretty well on the 8lb mono. After two spirited run, the fish had enough and simply coasted to shore. When I turned on my headlamp, I saw silver and was very surprised my first fish was also my most revered target fish! I let out a yelp so loud I think I woke up the neighbourhood LOL. 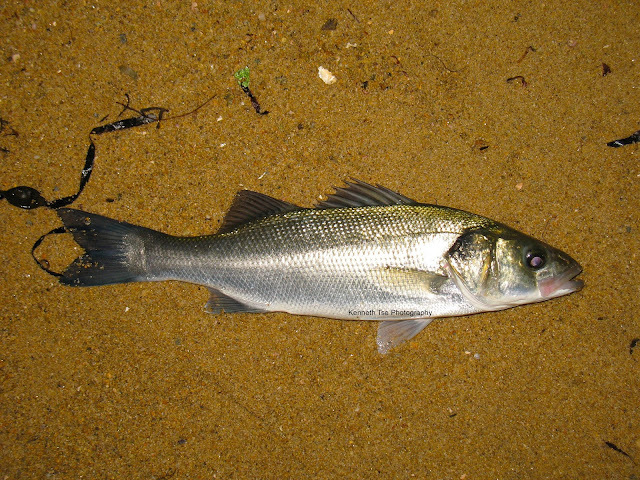 I took my first seabass at around 10pm on the first day fishing for seabass! Awesome! Since it had been a long day of travel and afternoon of seminars, I fished for another 15 minutes for no bites and decided to call it a night when the tide had bottomed out. I went to sleep very happy that night. The next morning, I woke up at 5am with thought of fishing early. It was rather chilly outside so I stayed in bed until 5:30am. In full dark, I headed back to the dyke. Peak high tide was at 5:30am and I would be fishing the beginning phase of the falling tide in the morning. There were a lot of surface feeding activities in the morning! Unfortunately, most of the fish were in the shallows far off to my left. There was a high stonewall on that shoreline. Trees and shrubs grew all the way up to the stonewall and the rocky beach was flooded on the high tide. There was no way to reach those feeding fish. Don’t be fooled…I did try fishing the area and lost a few lures to the rock and kelp. Plan B was to head back to the beach where I had caught the seabass the night before. Similar to the dyke, there were a lot of surface activities. However, most of the fish were about 100 yards from shore where I could not reach. I had two rods with me so I rigged up the long surf rod with Gulp! Sandworm and fished it on the bottom rig using #14 octopus hooks. I was hoping to pick up a few small beach species such as wrasse, sole, flounder and seabream. There was absolute no action on the surf rod or on my lures intended for seabass. However, when the sun rose, the surf rod started to get some action! There were many fast bites. However, the fish were either too small or too tentative that I couldn’t hook into any fish. I tried waiting for a good run before setting the hook, but most fish just pull line for about 3 seconds before dropping the bait. If I set the hook too quick, I wouldn’t hook up. I believe most hit were just small fish. When 8:30am came around, I had to return to my room for a shower to start the next day of seminars. I had plans to fish that night…but after about 4 drinks during and after dinner, I was done for the night LOL. It was 6am in the morning again when I woke up for the morning fishing session. I didn’t bother with the dyke but returned to the beach. This morning, there were very little surface activities for some reason. It took about 1 hour of casting before I got a hit in the blind. There were no surface activities 30 minutes when I got a hit. Again, my lure had just landed when I got hit. The fish fought like another seabass and it certainly was one. This one was between 13-14”…just a few centimeters short of the legal 36cm minimum slot keeper limit. Fishing was rather slow, but the sunrise was beautiful. I only took a couple of hits on the surf rod. Fish were just not active for some reason and the bites that I got were very short and fast. There was no enough time to even reach the rod! It was time to leave at 8:30am and the fishing session ended much too quickly! There was no plan to fish this night since we had a boat cruise dinner that would last until 10pm. During dinner, we had a massive seafood platter with some fresh, live clams. I never had live clams and personally, I liked them cooked better. There were a lot of live clams left after dinner and well…the looked like bait to me LOL. I took about 10 of them and stuffed them into my pocket for the next morning’s fishing session. Why waste good bait? LOL. This was my last fishing session on Ile de Berder. I had hopes of catching seabream and ballan wrasse here, but so far my fishing plans had not executed well. With live clams as bait, I had renewed enthusiasm. I had also found a new fishing location the day before on the walk back to my room. My new location was a rocky outcrop that dropped steeply into 5-6 feet of water with a rocky bottom. There were some isolated clumps of kelp that was very fishable. Instead of fishing for seabass, I put all my concentration into the surf rod. This rocky environment was prime for ballan wrasse. Again, the fishing in the dark was very poor on the surf rod. As the sun rose, I had a few rapid taps on the rod and set the hook on a little fish. This black goby loved the clam so much that it was able to take the #8 baitholder hook. Luckily, it was only hooked on the upper lip. 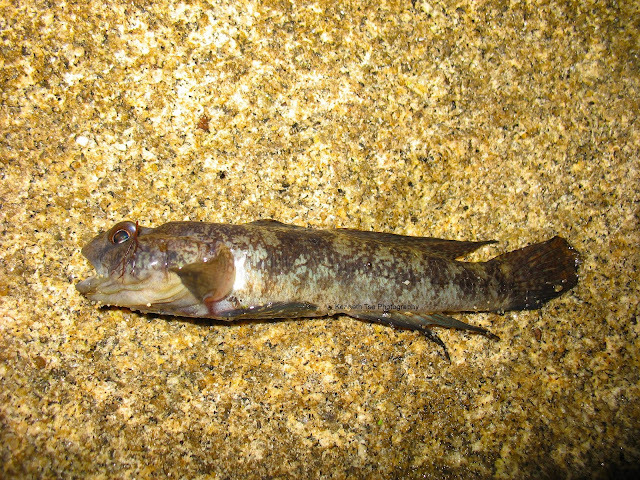 I caught another black goby about 15 minutes later. At 8am, the tide was dropping fast and the current was rather strong. I started to bottom bounce my surf rod with a 1oz weight. On my third drift, I had a couple of taps and set the hook on another little fish. This one was a wrasse! At the time, I thought it was a juvenile ballan wrasse and I was very happy to have accomplished my goal. 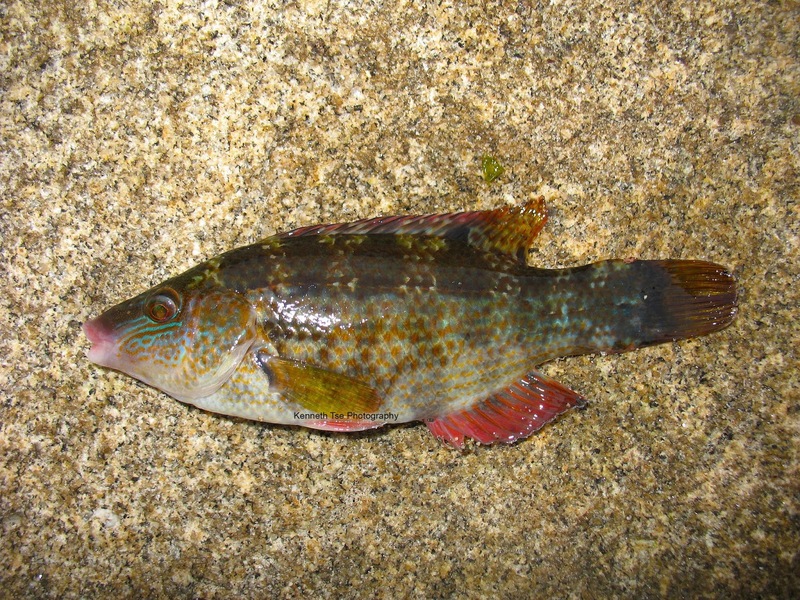 When I got home, I found out it was a Baillon's wrasse. Oh well, it was still a new species! I caught another Baillon's wrasse before 9am. I actually missed two morning talks because I was reluctant to leave without catching a seabream. Oh well…you can’t catch them all. 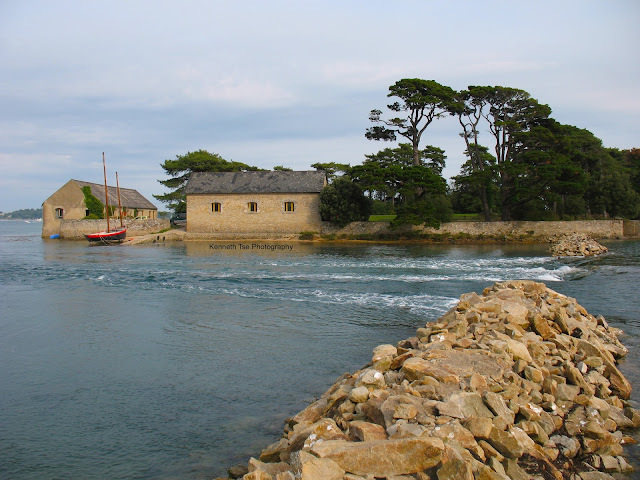 And such was my fishing adventures at Ile de Berder. It was a very beautiful and tranquil holiday location. One day, I hope I can be back to fish the area some more. 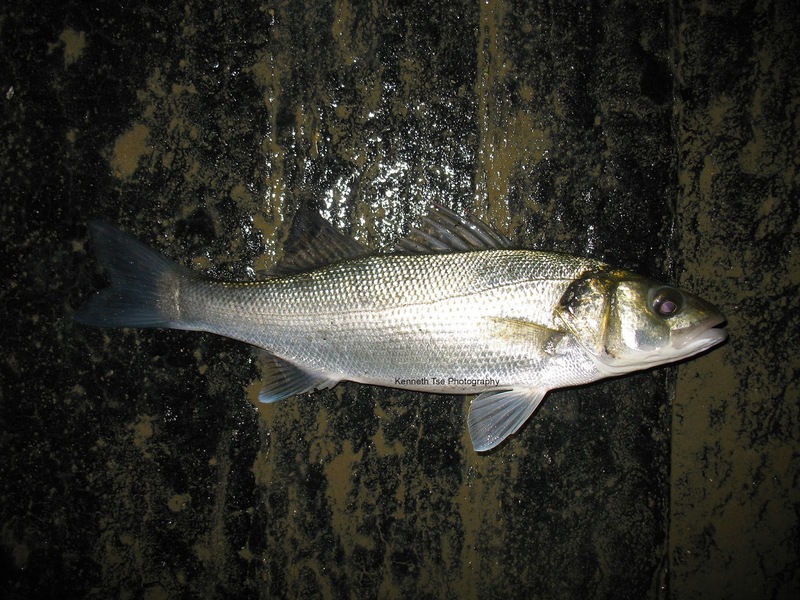 It appears that daytime yields more action from other fish species while nighttime was strictly seabass fishing. If only I had more time to fish during the day, I could only imagine the number of additional new species that could be caught.